As of 11pm on December 27, we currently have 1066 members on board for our inaugural season – which means the Founder’s Circle is all wrapped up! 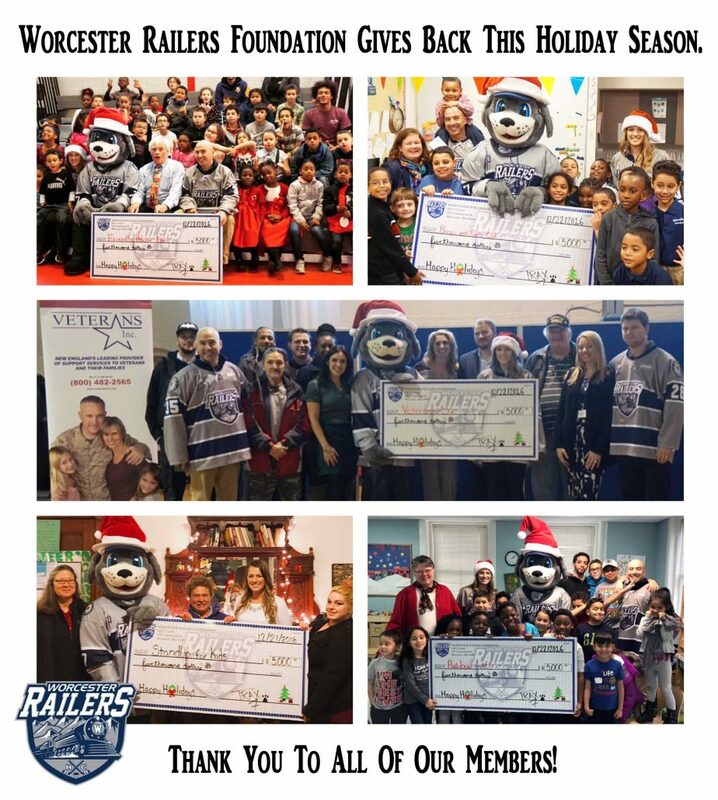 However, the Railers Foundation has teamed up with the Worcester Telegram & Gazette Santa Fund for a Holiday Power Play! For every new membership deposit between now and Jan 18, the Railers Foundation will donate $200 to the Santa Fund. For more information on the Holiday Power Play please click HERE. As of right now the Railers Foundation will donate $23,200 to the Santa Fund ($10,000 initial donation + the Holiday Power Play) – ALSO… we are working on our next members only event for January – will keep you posted! A BIG thanks to all of our members and corporate sponsors to allow us to make these great contributions to our local community! Without your support this would not be possible! Please click HERE to see the Charter TV3 news piece about the donations. Worcester Railers GM and head coach Jamie Russell has been very busy hitting the road over the last few months and working on an NHL affiliation. This weekend Jamie will be scouting three NCAA games including North Dakota at Union on Saturday night – remember Aaron Dell (North Dakota) and Troy Grosenick (Union) as former Worcester Sharks goaltenders?! Will keep you all updated on any NHL affiliation updates! Manchester (.690), Florida (.712), Toledo (.827), and Colorado (.690) all led their respected divisions headed into the holiday break….while the Indy Fuel headed into a much needed breather having lost 12 straight games…. Fort Wayne leads the ECHL in attendance (7.327 per game) and penalty minutes (20.11 minutes per game)….Toledo leads the ECHL in goals scored per game (4.38) and have the best power play at 23.9%….Tyson Spink (TOL) and John McCarron (FLA) have each recorded a four goal game this season….goaltender Ran Massa (ORL) made a season high 57 saves for the Solar Bears on Dec 22…. Curt Gogol is averaging 8.67 penalty minutes per game with Florida as he has 52 PIMS in just six games. Bill Ballou chatted with Railers owner Cliff Rucker and ECHL commissioner Brian McKenna and provided us an update of the business side of the Railers – click HERE to read the article. As of today I have 291 days until the Railers home opener at the DCU center on October 14 – just saying! That will do it…. If you have a question…. shoot me a line at EricL@RailersHC.com. Until next time…. HOCKEY, HOCKEY, HOCKEY…WOO!